One evening while waiting for the evening game drive to return, I suddenly felt a gust of air whoosh over my head as a white figure flew over. I soon realised that it was our inconspicuous barn owl guest flying around the lodge – this was the first time I actually had a chance to see it. 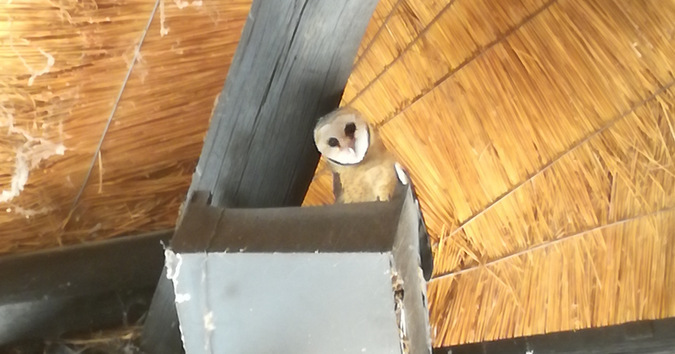 After a few nights of having this large barn owl flying in and out of the entrance to the lodge, we eventually came to the conclusion that she was nesting in the red-wing starlings’ nest above reception. Then the discussions began about whether she was actually nesting, or just taking refuge. Fortunately, a few weeks later, our questions were answered as we started to hear the tiny chirps coming from the nest. 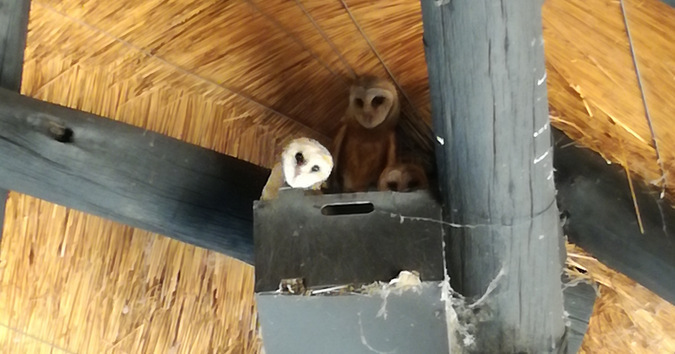 However, it still wasn’t enough to convince us that there were chicks as we thought the red-wing starling box was far too small for a family of barn owls. 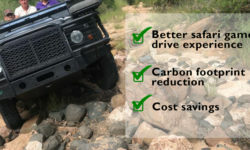 Well, we were proved VERY wrong! Eye-witness accounts of tiny barn owls popping their heads over the nest box were reported, with the initial count of three chicks. Though later, we counted four, and finally – after long debates and waiting – we saw five chicks! Over the next couple months we watched the chicks grow and we became very attached to them. 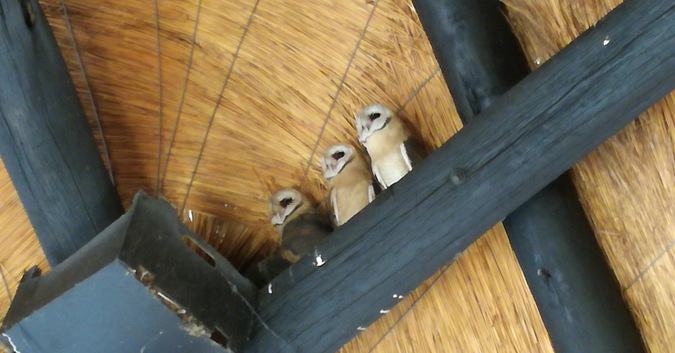 About two months after the first sighting, we found that they were becoming very confident and adventurous, with three of them leaving the nest to walk along the beams. Soon enough they found their wings and would fly around the entrance of the lodge – flying from the nest to the surrounding beams, as well as the roof of the reception and then chasing each other around. Slowly but surely the chicks started to leave the reception area in the evenings, spotting three of them in nearby trees the following day. It looked like they were ready to leave the nest, for good. We started the bittersweet countdown: five chicks… four chicks… three chicks. 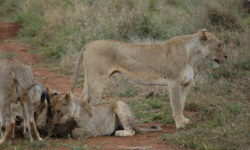 The remaining two were a little younger than the rest and stayed behind for a little longer. But we all knew the dreaded days would come where they would all leave us. We are now down to our last chick, who seems to have possibly made a home of the red-wing starling nest and may choose to nest here when she is ready. Thus, beginning the emotional roller-coaster all over again. Living in nature offers so many wonders each and every day, continuously reminding us just how lucky we are to be able to do what we do! 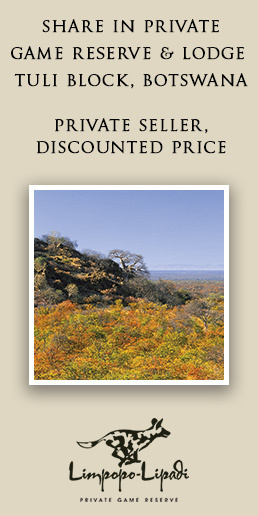 Leopard Mountain is a small family run Big 5 safari Lodge set within the Zululand Rhino Reserve. Thatched stone chalets carefully placed on a clifftop overlook breathtaking views over the river and wilderness below. 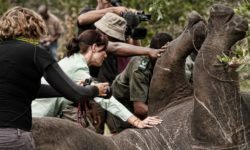 Experienced guides thrill guests on Big 5 game drives or guided walks through pristine wilderness, rich with abundant wildlife. Soak up the sun lounging around your private plunge pool and enjoy a romantic evening under the stars around an open fire with tantalising cuisine.